On average, blown 6809 and 6309 microprocessors are one of the most common failures in Color Computers. What makes this problem even more critical is that the 6809 and even more so, the 6309 are getting harder and harder to procure. Pro-Tector+ has been updated to provide even more protection for your CPU. All lines are buffered and protected, not just the address lines, giving your microprocessor the best chance of surviving jolted multi-paks and cartridges. Don't take a chance. Get protection with the Pro-Tector+ , an ingenious little piece of hardware from Cloud-9 that plugs into the CPU socket of your CoCo (soldering required). Virtually all Color Computers have their 6809 CPU soldered to the motherboard. 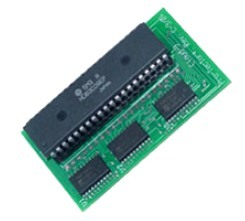 Therefore, use of the Pro-Tector+ requires desoldering the CPU and soldering the supplied machined socket. If you are not comfortable with this procedure, the please Cloud-9 for a quote on installation. Our refined process requires that the 6809 be clipped out and then the individual pins desoldered. This saves the delicate CoCo motherboard from damage. The 6809 will not be returned as it is non functional after installation.